I will be adding links to species' pages as I create them. While I have endeavoured to provide accurate information, my research may not be up-to-date or I may have made some mistakes. If you find something of concern I'd be happy to hear from you. My contact information is here. Dragonflies are the predators of the insect world, hunting smaller insects in flight. Their larvae also feed on other insect larva. They belong to the order Odonata, which has two suborders in Australia: Anisoptera or Epiproctophora (dragonflies) and Zygoptera (damselflies). Australia has 325 recognized species of dragonflies and damselflies, Victoria about 75 of those and I have seen and photographed about 60 species in Victoria and about 70 species in total. Most of the life of these insects is spent as an aquatic nymph. In colder regions this larval stage tends to be longer than in warmer waters. 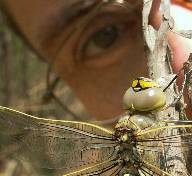 Some large dragonflies are believed to live for over a decade before actually emerging. This section of my site showcases some of my dragonfly and damselfly photography and might help some with their identification (particularly Victorian species). Dragonflies are not always easy to take photos of and usually I have to see them land somewhere. I then try to take a photo from the distance (to aid later identification in case it flies away) and slowly move closer, taking many bracketed photos. Sometimes the subject remains perched long enough to get some good close-ups. For the image on the right I was even able to make a hand-held self-portrait. I don't capture any insects nor take photos of them in captivity — all the photos you see here are of them free in the wild (and, yes, sometimes they do land on me). I also avoid damaging living plants during these persuits. For some images organized by species see down the left side. For more images (organized chronologically) see the links below. For the latest up-to-date images of my trips always visit all photos stored chronologically. NEW: I have created an online key guide, which asks simple questions (such as coloration) to help inexperienced people or those with no good reference books identify (or at least short-list) what they see. A common misconception is that to tell the difference between a dragonfly and a damselfly you merely need to look at the way they hold their wings when resting. Although this is true for many species, it is not unique to either group for Australian species. Identifying individual species can readily be done for many species if you know what to look for. This usually involves checking the markings on the thorax (body) and abdomen (tail). Mature males are usually easiest to identify as they typically have the most distinctive colors and markings. See the glossary for some technical terms used when describing these creatures. For Victoria I have now seen most species but I am still encountering new ones in surprising places. Here is a list of new species for me and here is a list of unseen Victorian species. NEW: My recorded sightings are available under Creative Commons Attribution 3.0 Australia (CC BY) and in Microsoft Excel and ANSI text (tab delimited) format: Reiner Richter Odonata.zip (28-Sep-2016). Please read the included license file before extracting the data. This data is now also available interactively via the Atlas of Living Australia. Sometimes discoveries are made which warrant special reports, such as discovering a new species. Following is a list of reports made from my own observations. They are in PDF format and can be used as reference sources. A collection of sighting reports with many photos available. The Chew family have an extensive web site of the insects they have found around Brisbane. DragonflyPix (Australian Checklist) has a list and some photos of Australian species (plus an almost complete set of photos for European ones). Deane P. Lewis's contains a section for dragonflies. He is based in Queensland. The public Wikipedia has good information on dragonflies and, to a lesser extent, damselflies. There are also some images available, including an image showing morphology (body parts). In 2006 the CSIRO published a great book, The Complete Field Guide to Dragonflies of Australia by Günther Theischinger and John Hawking. In 2009 the NSW Department of Environment published the Identification Guide to the Australian Odonata that you may still be able to purchase or download (9MB PDF).